Thank you so much. :) The tomatoes are incredibly sweet after roasting for so many hours. If you get a chance definitely give it a go! I bet this was a delicious pasta. It sure looks like it. Hahaha, at least you’re honest! And it’s healthy gluttony.Or should I call it that? I’m sure there’s a nicer way of putting it. I do love roasted toms. Or just pan-fried and rubbed through a sieve. I don’t buy tinned toms any more due to their leaching/reacting to that horrible plastic inside the tins. Ha! Yeah, it took a few days for my stomach to settle down, that’s for sure! I noticed glass container tomatoes at the market; quite expensive though. It’s probably better to eat tomatoes only when they are in season, and forget about buying them in a can. I certainly don’t buy any other vegetable in a can! The slow roasting created (an almost) sun-dried effect. They were very sweet and not quite dried out. And the sage crisped up like chips! So good. 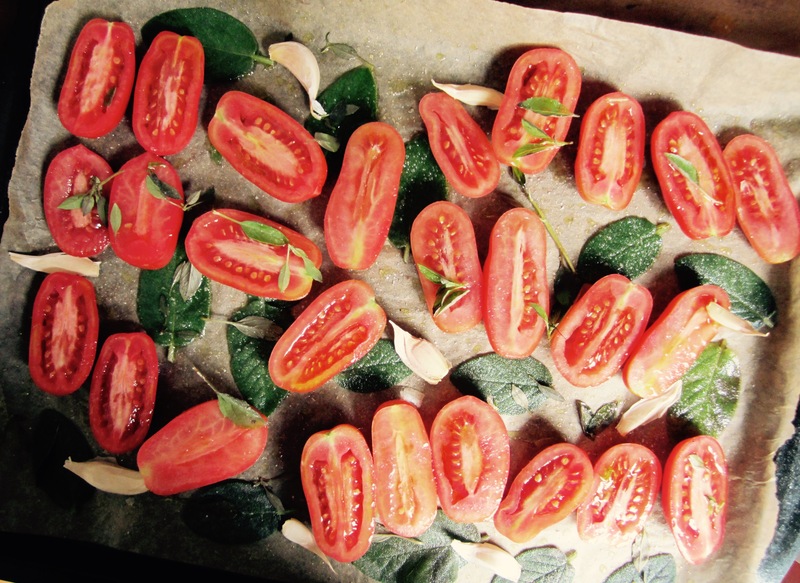 yum – love roasted tomatoes!! I planted paste tomatoes here in NE and have harvested about.. 4 : ( so sad. Glad to hear you’re having a good season in Seattle! This looks so fresh and delicious! I tried growing San Marzano tomatoes last year but I think it was to hot here. Romas do well though! Ohhh love those perfectly roasted wrinkly tomatoes! And they’re from your own garden – lucky lady. I’m so glad you’re back to pasta Seana. I absolutely love this post – particularly since I have a garden full of tomatoes, homegrown garlic, and sage. I can’t wait to make this. And since I have arugula in the garden – I’ll add that too. Inspired by you. Always! Hi Lindy! I’m finally coming off a little pasta kick! I didn’t eat it for months and months and then something just clicked and I couldn’t get enough. You must make this with all your wonderful homegrown produce, you’ll absolutely love it! Please let me know if you do…especially the slow roasted tomatoes. Even if you don’t serve them on pasta it’s worth it! Always…always lovely to hear from you!! I bought similar tomatoes yesterday and ate them in a salad, but they are pretty expensive here (such type).. Love pasta! It’s always a winner! Seana, these look absolutely delicious! Sadly, I didn’t plant any plum tomatoes this year. I regret that with it being such a hot summer! But I got some stellar yellow and red cherries! No we don’t, do we? Take care and enjoy the kiddos! Your tomatoes look so beautiful roasted and tossed through with the pasta and a few other classic ingredients! I could eat this happily ANY night of the week Seana! Thank you so much Margot. Like you I can eat it every night as well. It’s a matter of fact my husband was out of town and I ate what would have been his share over the course of a few days! :) Lovely autumn dinner party post!! It looks wonderful. Thank you again for inviting me to take part. It was so fun and I look forward to doing it again. Aren’t they irresistible? LOVE roasted tomatoes! These looks so wonderful. It really is a treat of nature. 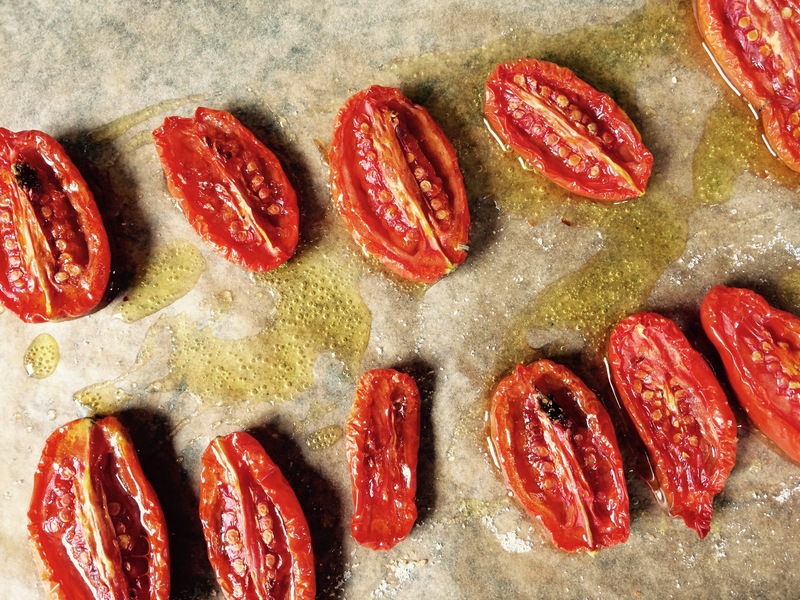 Slow roasted tomatoes are so sweet and perfect. I love that you roasted them with herbs and threw them in a light pasta. Simple meals like this are one of life’s truly great treats. So gorgeous! I love a fresh and simple pasta, the flavors just really stand out. Thank you so much! I agree. Simple is best. So great to hear from you Mary Frances. :) Thanks for stopping in and leaving me a comment! I love roasted tomatoes too! We were making them a couple times a week when we had loads of tomatoes from the garden. Especially slow roasted. They turn into such a sweet delight! Yumm that sounds so good! You made me so happy when you dried your own tomatoes. Well done. Very well done. Absolutely fabulous, Seana! 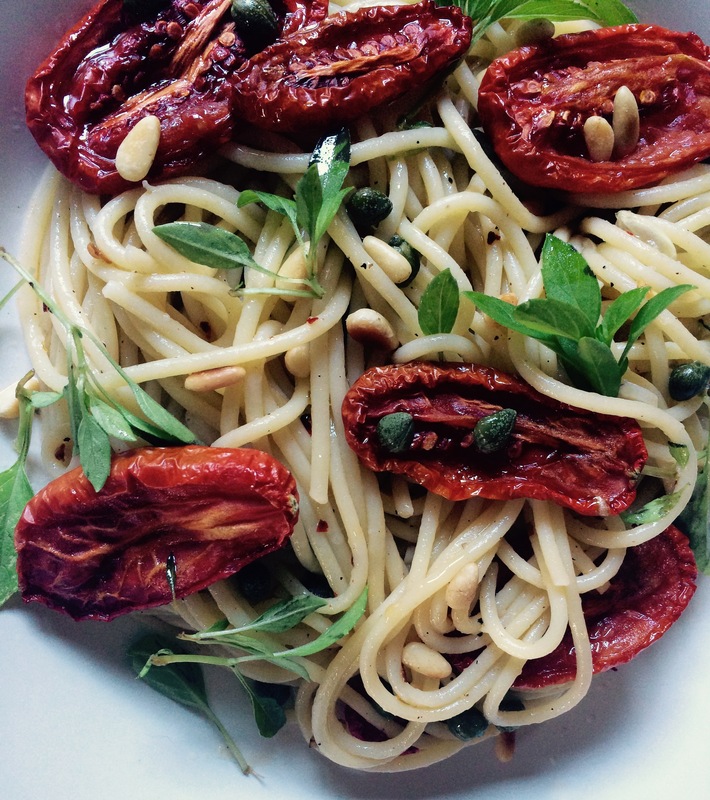 I love how you roasted the tomatoes and how it was used for the pasta. So nice to see your presence here today Fae. :) I am feeling very encouraged by your lovely comments. Thank you. 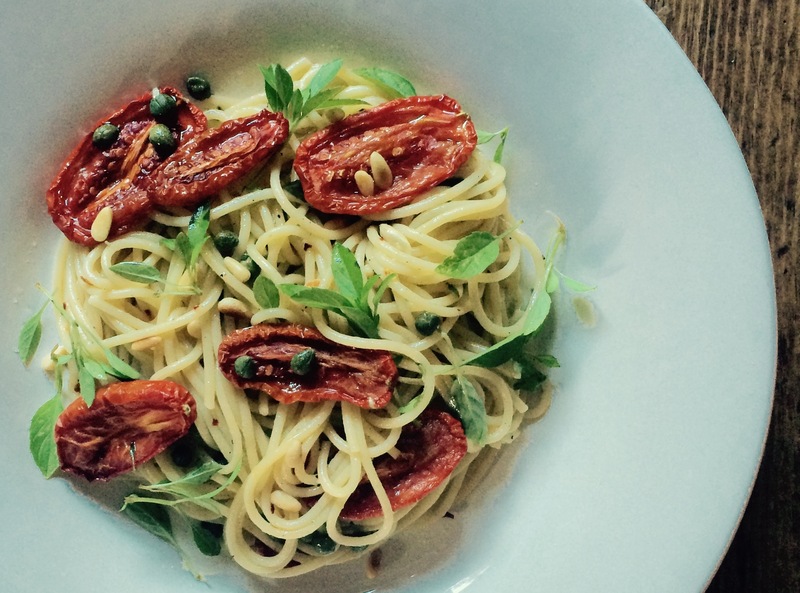 You are currently reading spaghetti with slow roasted tomatoes at COTTAGE GROVE HOUSE.